Compo Beach sure looks and feels a lot different this year than last. If you haven’t noticed, you’re not paying attention. Or maybe you can’t get in. A quick recap: This past winter — in response to Westporters’ rising complaints about overcrowded parking, picnic tables and sand — the Parks and Recreation Commission did some rising itself. They raised the price of season beach stickers for Weston residents, from $250 to $375. They raised it for all other non-residents even more: from $490 to $775. Daily passes rose too. They’re now $50 on weekdays, $65 on weekends. Westporters’ prices rose slightly. A season sticker is now $50 ($25 for seniors). Parks & Rec also instituted caps on sales. They limited non-resident sticker sales to 350 (from the previous 600). And — perhaps most significantly — there is now a daily cap: No more than 100 non-residents are allowed in each day. Signs on nearby roads indicate when the limit has been reached (sometimes as early as noon). South Compo Road, just before the Minute Man. Add in newly remodeled bathrooms on both sides of the bathhouses, and extra grills at South Beach; a new entrance pattern and special parking area for non-residents — leaving prime beachfront spots for Westporters — and the difference is palpable. Many beachgoers love the “new” Compo. They applaud the space they’ve got, the availability of picnic tables and grills, even the lower decibel level. Compo Beach isn’t always this empty. But it’s a lot less crowded than it used to be. They wonder about lost revenue. Though Parks & Rec said that increased fees would pay for better maintenance and the full-time cop, it seems from anecdotal evidence and those daily cap signs that the beach is bringing in a lot less money than it used to. That probably also affects Joey’s by the Shore. It may have contributed to PAL sitting on a few hundred unsold fireworks tickets this year — thousands of dollars that won’t go to programs and kids. And smaller crowds means less “life” at the beach. There are fewer languages spoken, fewer games played on the grass, fewer opportunities to share our shore with others. Plenty of people think that’s great. It’s our beach — paid for by our tax dollars. Others miss the out-of-town regulars they used to see, and worry we’ve only added to our “elitist” image. What do you think? Do you love the changes, and think they’re long overdue? Do you think they’re too draconian? Are you conflicted? Click “Comments” below. And — as always — please keep things civil. Play nice in the sand. 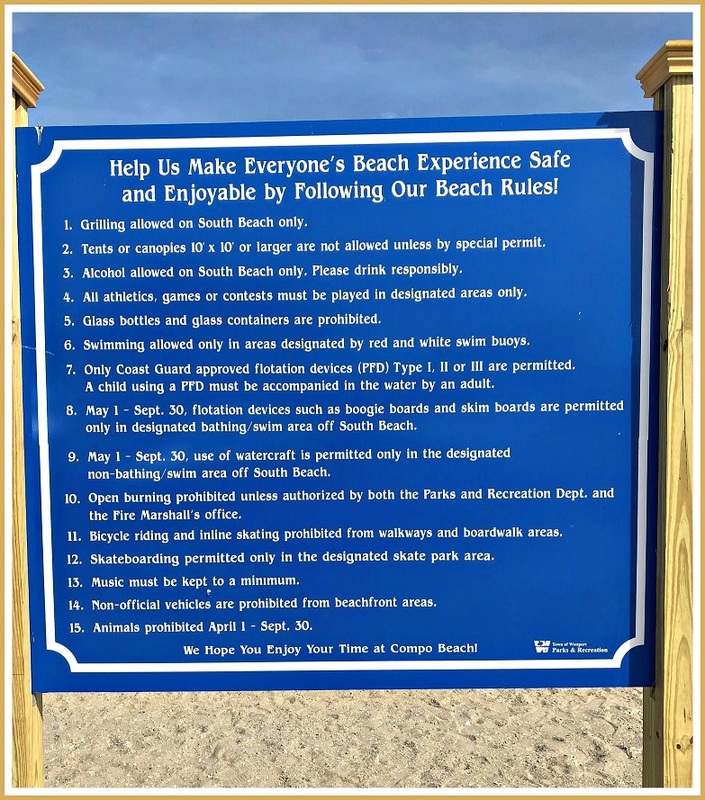 As part of its changes, Parks & Rec posted several signs outlining rules at Compo Beach. 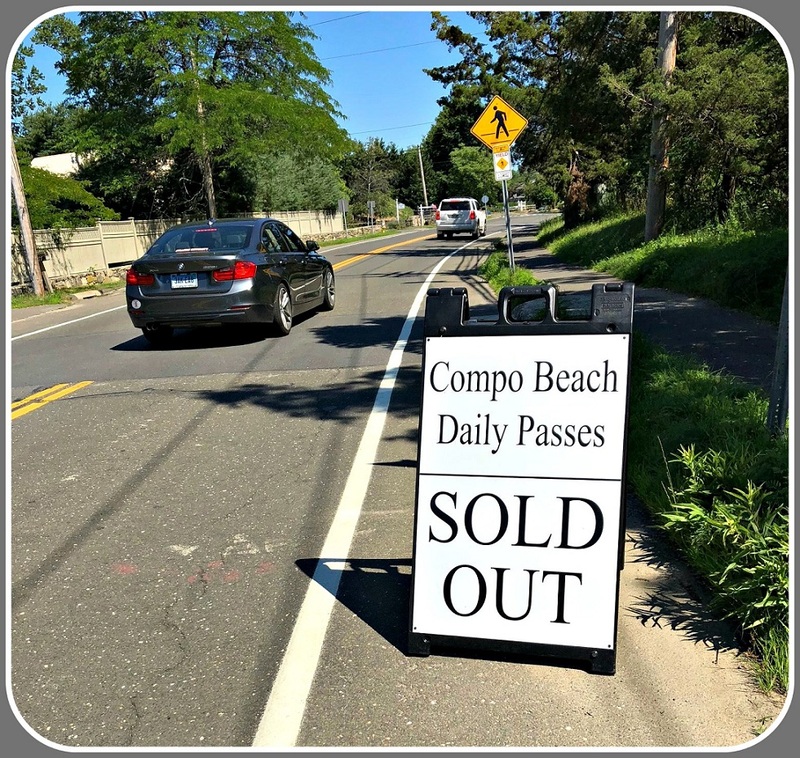 This entry was posted in Beach, Economy, Organizations and tagged Compo Beach, Westport Parks & Recreation Commission, Westport Parks & Recreation Department. Bookmark the permalink. It’s. Town of Westport amenity. Should stay that way. You can always go to Sherwood island. Ohh and that’s free for ct licensed vehicles. Why pay taxes to not enjoy what you pay for. I think the new adjustments that have been made are great and long overdue. Things take time and everything is a process, therefore you will find some people who love the new adjustments and some people who will not. I love the changes. Last year, I didn’t even go to the beach. With small children, it was just too insane to navigate and it wasn’t fun. We’ve been several times. It’s always had plenty of life, but it’s been way more manageable! As for the fireworks, I’d say the fact that they were on a Monday and two days before the actual holiday was the real culprit. Not to be cryptic but from what I have heard – from very reliable sources – is that the coffers are still very full. In the past, they haven’t been tapped to even 1/2 of what is allocated. Kids programs won’t be affected. I can’t speak for Joeys – but that is a private establishment. Insofar as the diverse factor, I am Latin and I am very sensitive to this issue. However, I go to the beach about 3 times a week and have seen other ethnicities enjoying a cleaner, better Compo. I am heartened by the facelift and feel that it is long overdue. I’m not crazy about how strict they have become about no ‘boogie boards’ prior to 6:00 – but it’s not a new rule. They are simply enforcing the ‘no flotation devices’ harder this year. I would like to see one more lifeguard stand. This past weekend – an older gentleman was having difficulty getting out of the water and was starting to float – face down. His family ran out to try to help him but the lifeguard didn’t see him because the gentleman was between two stands in the water. My husband had to run to the lifeguard to flag him down to run out to the water. The lifeguard staff was on it with medical equipment very quickly. But it was a scare that the lifeguard didn’t see him. I agree- it seems to me that there are less life guards? I’ve been going since 1972, so I know it pretty well. Maybe they just spread them out a little. I to HATE the no boogie board rule. I just like to half float for a long time, and south beach is so grassy. And there are signs every where- kind of ugly. HOWEVER – I love the fact that you aren’t “cheek to cheek” with your fellow beachgoesrs! It is so much more relaxing!!!!! My neighbors were speaking German on one side, and Italian on the other yesterday. We are at the beach several times a week. The changes are a welcome relief to last year’s sitting on line to get in while people bought passes or didn’t know what line to go into to do so both lanes were blocked. While I am not a huge fan of lots of signs, they have helped traffic flow. In addition, seeing smiling staff helping with traffic is always a reason to wave and smile back. There are still crowds but not overcrowding. Agree that fireworks issue was because of the day not any new rules. Every time we go down we comment how much nicer it is to go to the beach this year. I’m in full support of the changes at Compo…what a relief! Change is good but change takes time. It’s a great change and was long overdue. Our town needs to still have that ” small” town feel. I am in full support of the changes. Well done! Love the changes. But this whole boogie board thing is quite annoying, I am not sure of ANY beach that bans their use. Its not like there are waves of any type, except wake from passing boats. They should amend the rule, and if it happens to get rough have red flags by the lifeguard stand to signal no boards. Just a thought. Lets turn Westport into a virtual country club environment….. I am not against measures against overcrowding but it could have been done more measured than 50% price increases. If there is an impact on Joeys I do not feel sorry for them. It is about time somebody stepped in to run something other than the junk food shop they run. Do they have the right to run this forever? I LOVE JOEY’S, and they have a ton of very healthy options!!!! The results of previous Compo rules speak for themselves. I applaud the town and Westporters who have spoken up to restore this town treasure to those who are residents and pay the taxes for this treasured amenity. I see no reason whatsoever to downgrade Compo just to be PC.. Kudos the everyone who worked hard and thoughtfully to implement these changes. We have been to the beach more thus summer and it is delightful. Congrats to all. I happily and heartily join the majority voice here. Thrilled with the improvements and all the entry changes that allow me to easily drive in and park. I believe in being welcoming … and I also believe in keeping our small town a small town. It’s a fine line, and I think we’re straddling it well. 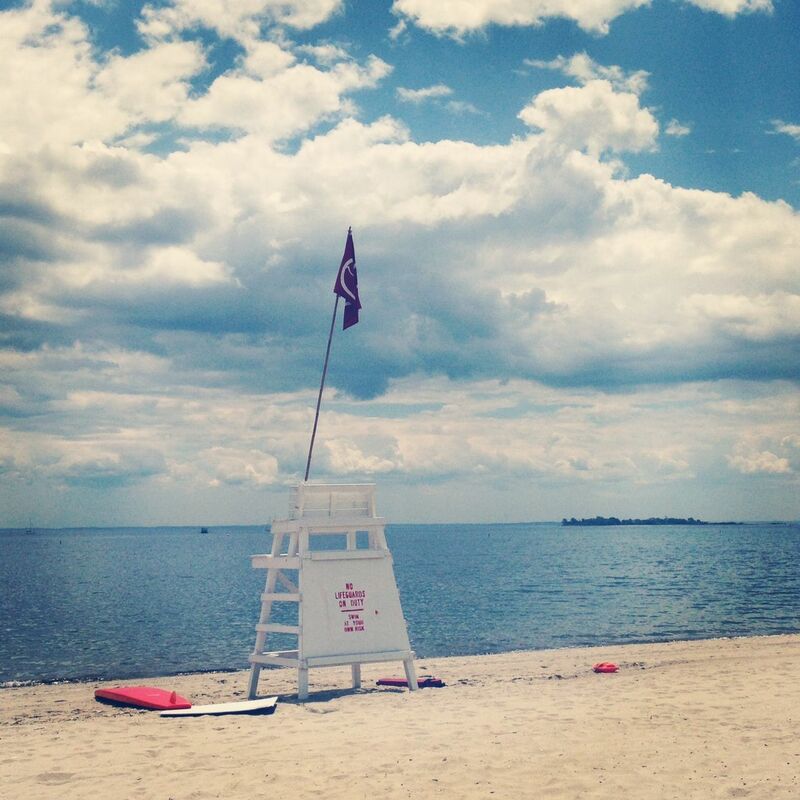 Thank you for your comments regarding Compo Beach improvements. Although we applaud the town’s efforts to make the beach more amenable for residents, we would like to to provide another perspective. My partner was a resident of Westport for nearly thirty-five years; I lived and worked in Westport for 11 years. We were avid beachgoers. Two years ago , as seniors, we decided to downsize, but were unable to find suitable moderately priced housing in Westport that met our needs. We found it necessary to leave a community that we loved because we could no longer afford the cost of housing. We moved to Wilton, where there are many more moderately priced housing opportunities. We continued to serve as volunteers in the Westport community. We continued to support many Westport businesses on a daily basis, including the beach; although the out-of-town $490 fee was steep, we decided it was worth it because of our love of the beach. When the fee rocketed to $775 this year, it became out of our reach. On one hand, we understand the desire of the community to protect its assets. On the other hand, what does it say about a community that makes it so challenging for others ? Somehow, it doesn’t say anything very positive, especially in the unkind environment we currently find ourselves living in. You make a valid point. Perhaps the town could implement one more category: A lower fee for long-time Westport residents who, as senior citizens, must move outside the town. The criteria would have to be fairly strict and provable – maybe a minimum of 20 years residency, being over 65, and moving only to one of the immediate towns (Fairfield, Wilton, Norwalk, for example). And of course there would be a restricted number of issued permits in that category — the same first come, first served policy as other categories. It’s worth petitioning the town to consider that option. Greatest gratitude! To all those that implemented new changes. It was way over due. The noise levels and gross inconsideration for allowing those of us who love pure nature and quiet for its restorative healthy benefits. Thank you so much Dan for posting this, so grateful to being back . I’d pay a higher fee as a Westport resident. As a 3rd generation Westporter and now an ex-pat I realize I no longer have skin in the game but Westport will always be home to me. The town’s beaches are very special and it’s not surprising that they are so popular. However, the current residents and taxpayers who are funding the maintenance of them should have priority and not be crowded out. Life’s not fair- some things can’t be all inclusive. My summer job in my college years was as a Parks & Rec beach security guard and I confess to having perverse pleasure in denying entry to non-residents who wouldn’t pay for a day pass. Life’s a beach! I’m actually a bit surprised at some of the reactions (or lack of reactions) to this post as well as prior posts when the new fees were being rolled out. What Westport has done with Compo Beach is rather analogous to what the evil one himself has been advocating with respect to immigration – keep Westport for Westporters and severely restrict and/or make it economically unattractive for non-Westporters. Which, oddly enough, is not being decried but generally applauded by Westporters with little, if any, comment from the normally vocal Westport Trump is not my President contingent. I mean, where is the outcry for open beaches? Why aren’t the folks calling for the elimination of ICE also calling for the elimination of beach security? Taking no position on the merits, does anyone else find the cognitive dissonance odd? Or is everyone at the 06880 beach party going to be rocking MCGA* hats along with their not my president pins? ummm…thanks? Nothing personal, Nancy, but your supportive words on an 06880 post are about as helpful as Richie Incognito’s support of Shady McCoy. I love the new rules and the beach is actually a pleasure to go to again. Great job! Not a fan of the new Daily Pass rules. And what’s with the segregated parking? I was loving how heterogenous the beach was feeling the last couple of years. Booo. For frisbee throwing and other games. I think it’s great! I don’t think it’s being elitist to protect westports crown jewel of beaches. It’s terrible to be packed in with so many people who don’t live in Westport. I think we are inclusive to Weston. After all it’s not that large of a beach. Everyone else should go to Sherwood Island. It’s a beautiful beach and it’s free. Good job Westport! I think they need a fair senior price for those of us who live so close and have been long time residents of Westport. Raising it to $775 is very extreme! Thank you P&Z. The beach is so much better and so are the availability of grills. This all adds up to increasing our home values. I applaud the changes. For those who are displeased there’s always Sherwood State Park.